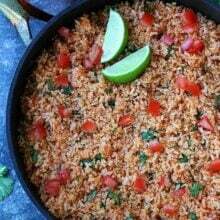 Cilantro Lime Rice is easy to make at home and is the perfect Mexican side dish! This easy rice recipe is a family favorite, we make it almost every week for dinner! We got invited to our friend’s birthday party and were asked to bring a Mexican side dish. Josh made Cilantro Lime Rice to take to the party. The rice was a hit! 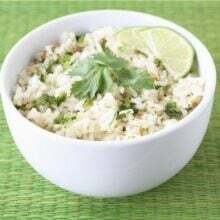 Cilantro lime rice is one of our favorite side dishes, we make it all of the time and it is always a winner! You will love this jazzed up rice recipe! We cook the rice in vegetable broth to give the rice added flavor. If you don’t have vegetable broth, feel free to substitute chicken broth. 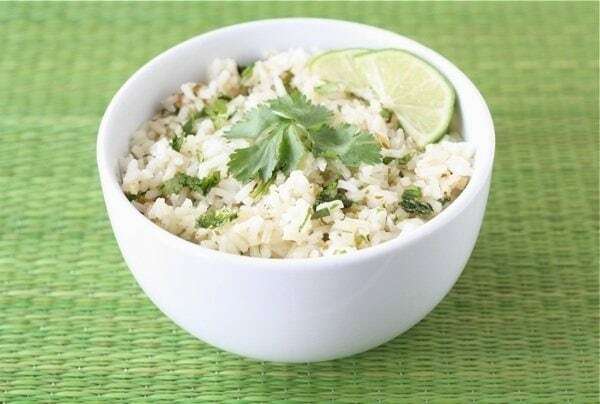 Fresh lime juice, zest, garlic, and cilantro jazz up the white rice to create an outstanding rice dish. We also add a little butter because butter is always a good idea and adds great flavor to the rice. 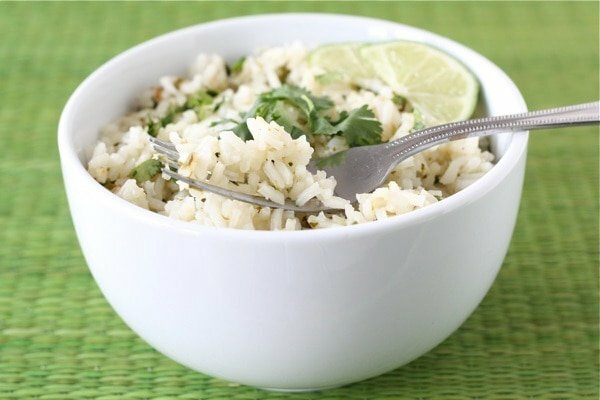 Cilantro lime rice is a great side dish to any Mexican meal. We often serve it with enchiladas, burritos, tostadas, fajitas, and tacos. It is simple to make and pairs nicely with all Mexican food. It is also perfect for making burrito bowls. We make cilantro lime rice for the base of the burrito bowls and add ALL the fun toppings! Did you know you can freeze rice? Yep! If we have leftovers after making a big pot of rice, I will freeze some. It always comes in handy! And if you like Chipotle’s cilantro lime rice, you will LOVE this recipe because it is SO easy to make at home and I think it is just as good…maybe even better! YAY! 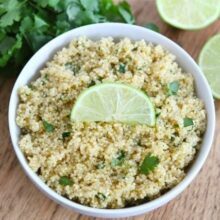 If you like this cilantro lime recipe, you might like our Instant Pot Cilantro Lime Recipe recipe too! 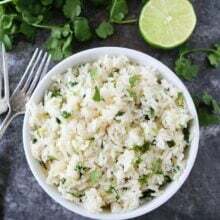 This easy cilantro lime rice is the perfect side dish to any Mexican meal and it tastes just like Chipotle's rice, but BETTER! In a a saucepan combine rice, butter, garlic, lime zest, 2 teaspoons of lime juice, and broth. Bring to a boil. Cover and cook on low 15-20 minutes, until rice is tender. Remove from heat. In a small bowl, whisk together lime juice, sugar, and cilantro. Pour over hot cooked rice and mix in as you fluff the rice. Serve warm. This is my favorite kind of rice! I just saw another post for it and it made me crave it! Delicious! You totally read my mind! I was craving Chipotle’s cilantro lime rice and was planning to do a web search! Thank you! Maria, your food is always so beautiful and delicate looking…just so pretty. You are the queen of lemon and lime pretty food! I love how simple this recipe is. Cilantro is such a great pair with lime. Great recipe! What delightful flavors! That is a great side dish. This looks lovely. I have never had cilantro lime rice before, but looking at the ingredients, I can imagine how the flavours go together. I’ll have to remember to make this the next time we have Mexican at home. Your cilantro-lime rice would go great with my broiled fish tacos today! What a nice flavored rice side dish! YUM! I can’t wait to try it. This is my favorite rice to stuff inside burritos. So yummy! we love this, too! I usually make mine with brown rice since we always have that on hand, but it’s such a fun side dish and makes the perfect base for big taco salads. Yummy! What a simple rice side. I admit I always use the boxes of Mexican rice on the side of pretty much any Mexican dish, but I’ve been looking for something different and this is perfect! Thanks for sharing, Maria and Josh! This is an awesome rice! I love the flavors. So easy to dress up some plain ole rice! Yum! Yum! It’s like the rice at chipotle but far less bad for you and, I’m sure, far more delicious! I’ve made this before. It’s so good with a lot of different cuisines. Love a good cilantro lime rice! Yum! must try this and compare to Chipotles, which is my favorite…this looks just as good! Mmmm, this would be the perfect partner to our Chimichurri Flank Steak or Pineapple-BBQ-Glazed Chicken. Love this. So glad to find this recipe! I’m often at a loss as to what to serve with southwestern recipes. We get tired of the same old refried beans and “mexican” rice. This is going to be perfect with the fajitas I’m planning for tomorrow’s dinner. Thanks! You are welcome! Enjoy the fajitas! We love it here too… it’s so easy to make and tastes fantastic. I’ve never had this kind of rice before but I’m 99% positive that I would *love* it. Going to try it soon!! could I make this in a rice cooker? Yum! I just recently forayed into flavored rice, with Carrot Ginger Rice, from Allrecipes.com. Very very delicious! Can’t wait to try it. What a great Mexican side!! Sounds so fresh and yummy!! yum! i can think of so many dishes to eat this with! I just posted this today too! It is amazing rice! LOVE it! 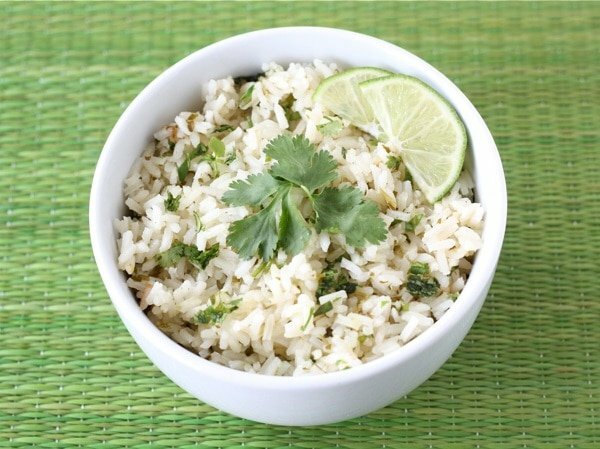 cilantro rice makes a regular appearance here in our house – LOVE IT!! Looks great. I love the flavor of lime! I am obsessed with the cilantro-lime rice at Chipotle. Sounds like the perfect side, Maria! I love new ways to make rice–thanks for sharing! YUM! I love cilantro lime rice! 🙂 Looks mighty delicious!! I love lime and I love cilantro. I think a very limey Margarita would go well with this dish! What a lovely, simple rice dish. The cilantro and lime would make it the perfect accompaniment for fish. So I made this and while I loved the flavor, I can never get the texture right with rice. Mine always ends up mushy. Do you have any suggestions on how to make rice and get it to be fluffy? Hmmm, ours is never mushy. Did you add too much liquid? Do you stir with a spoon? Try fluffing the rice with a fork. Just wanted to say it again, this rice is perfect! Burrito bowls made with this rice have become a staple at our house. Thank you, thank you, thank you!! I also made this recipe and had trouble with it turning out mushy. Seemed like way too much liquid. I usually use 2 c. liquid to 1 c. rice, but this called for almost 3 c. liquid. Also, the vegetable stock I used was so dark in color that it didn’t look nearly as appealing. Any suggestions? Sorry you had trouble. We have never had the rice turn out mushy. Try reducing the liquid if you need to and look for a light colored broth. You can also use chicken broth. Pingback: Taco Tuesday, Part 3: Sweet cilantro rice | is this REALLY my life? Yum, the Mexican version of sushi rice! This cilantro lime rice was SO good! It taste delicious! However, we ended up cooking it for a lot longer than it called for. Next time should be good though! I made this dish for a party but it was so mushy I tossed it all away and started over. There is WAY too much liquid in your recipe. Is it okay to use JASMINE RICE instead?? Thank you for the recipe. I’ve made it several times and those that don’t like cilantro (I’m in the Midwest after living 30 yrs in CA), love this. For the first time, I’m cooking for a large group and this was requested. Is this freezable? I haven’t tried freezing it! Sorry! Let me know if you try it! We made this tonight and it turned out perfect! The texture was spot on. I love how flavorful it was—savory, cilantro-herby and with a kick of lime. My family did a Cafe Rio knock off night and everyone thought this rice was amazing. Love all your recipes, Maria. I can always count on your site for great dishes! Hi! I really loved this recipe but when i put in the vegetable broth the rice turned yellow…. it was still really good but do you think i should buy a different brand of vegetable broth? ive bought it at fresh and easy and trader joes, both times it was organic vegetable broth. I have used a 1/2 cup but it still changes color. Would you have to make any changes to use brown rice instead of white? Can you answer a question about the recipe? It looks great, but between the broth, water and lime juice, that looks like about 3 cups of liquid to one cup of rice…which seems like alot. Usually it’s more like 2 to 1. Is this correct? I want to try the recipe, but I don’t want to be left with a soggy mess! Thank you so much…..
We make this recipe a lot and our rice is never soggy! I hope you like it! Made this for my daughter’s birthday party and everyone raved how good it was and how it tasted like Chipotle!! Thank you for making it simple and delicious! I made this to go with enchiladas last night, and while the flavor was good, the texture was not. It was closer to porridge or mashed potatoes than individual grains of rice. Like many other commenters have said, there is way too much liquid in the recipe – perhaps you use a different kind of rice or cooking method, but following the instructions on the recipe for a 3-1 liquid to rice ratio as written yields a mushy result. I will try this again without the water since I did think the flavor was good, but when you get the same feedback from different commenters about a mushy result, I would suggest that you check your recipe, since a 3-1 liquid ratio for rice is fairly high. This recipe has way too much liquid. I knew 3 cups of liquid for only 1 cup of rice sounded incorrect but I decide to follow the recipe exactly. There is NO WAY this could ever be made with 3 cups of liquid and not turn out mushy. Please test this recipe again and correct the amount of liquid. I too wasted precious time and ingredients making rice that is nearly inedible. The flavors are great, just WAY TOO MUCH LIQUID. I have not seen one comment on this recipe say the rice turn out good – every comment by someone who actually made the rice says it came out mushy. Please fix your recipe before other blog followers waste time and ingredients making this rice. Just joined this site. 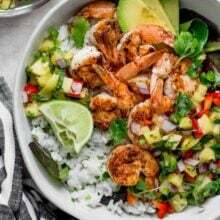 The cilantro lime rice sounds delicious, as does the rice bowl.. I will make it with brown rice, however. Don’t like white rice. Why 3 cups of liquid if using only 1 cup of rice? I made this and it was delicious but I used only 2 cups of chicken broth and omitted the sugar and it came out perfectly. I made this recipe and it is delicious. I omitted the cup of water as I use 2 cups of liquid to a cup of uncooked rice and it turned out perfect. Hi! I’m so glad I found your website! I am hosting a dinner party for 12 and our theme is Mexican cuisine. I would like to make this rice as a side dish, and wondered how many times I should double the recipe to have enough for everyone. I am a big rice guy. I literally eat rice every other day and looking to learn to cook different types of rice. Thanks for putting this all together. Just the right blend of flavors. The kiddos liked it just as much as the adults. Yes! Brown rice will take longer to cook. Could this be made a day or two in advance of serving?